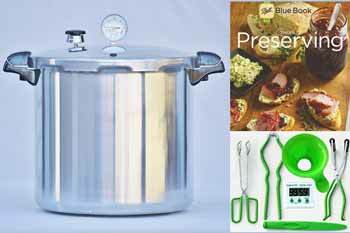 Whether you are just getting started or have years of experience in pressure canning and preserving under your belt, our Presto Pressure Canning Kits offer a solution to your home canning equipment needs. You will receive three essential items at one low price. This special offer saves time, money, and effort over finding, pricing, and purchasing these items separately. Presto Pressure Canners - Constructed of extra-strong, warp-resistant aluminum and are suitable for use on regular and smooth-top ranges. They also double as water bath canners for preserving fruits, jams, jellies, pickles and salsas. 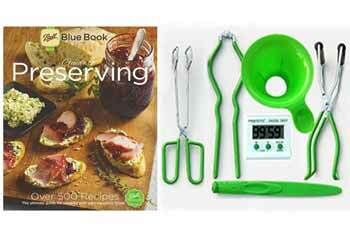 Includes cooking/canning rack and complete instruction and recipe book. Ball Blue Book - Guide to Home Canning, Freezing, & Dehydration. The Ball Blue Book is a comprehensive reference on the subjects of Home Canning, Freezing, & Dehydration. From the very basics to advanced techniques this book is sure to please everyone. Presto 7 Function Canning Kit - This 6-piece accessory set includes handy tools for all your canning needs. 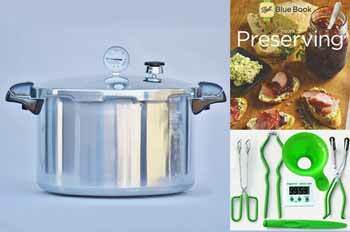 Includes a Digital Timer, Canning Funnel, Combination Bubble Remover/Lid Lifter, Jar Lifter, Jar Wrench, and Kitchen Tongs. *Savings is based on a individual purchase of each item in the canning kit. Purchase price for all the items in the canning kit individually would be $30.25. ***Warning: Presto 7 Function Canning Kit contains DEHP, a chemical known to the State of California to cause cancer and birth defects or other reproductive harm.